Hello Darlings! Love is in the Air everywhere….LOL So Corny but so true! I looove Valentine’s Day! The best part is that you can make whatever feels romantic to you. Of course I am for being romantic any day…nothing like a spontaneous love attack, right? But let’s stick to the season and share some Love!! The theme in the house this week is LOVE! So lets spread the love and bring your amazing project to the house! Invite your friends to join the fun! The Link for you to enter the project is at the very bottom of this blog. The prize? A nice Gilli Pack for you and if you use a Gilli you can be spotlighted together with out DT!! GILLI House for the Winter Challenge ! I'd like to share my card for the Winter Challenge ! for this Winter card ! papers and embelies are from my stash. for the snow details on the card. See more details on my BLOG !! Happy Thursday everyone. You still have a few days to enter into our Winter challenge. The entries are all so wonderful, hope you will join in. 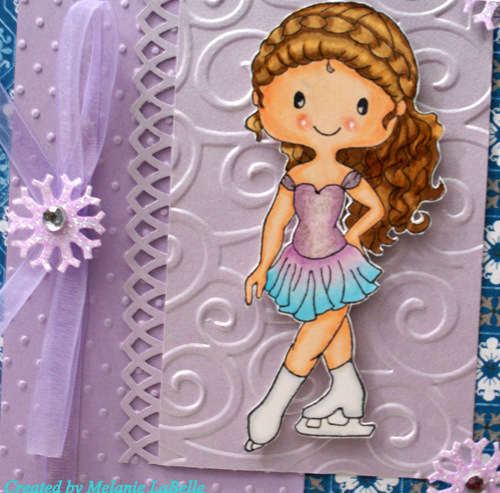 For today's card I colored Skater Gilli with Copics, isn't she adorable. My DP is by Authentique, Journey. The snowflakes are by K and Company that I sprayed with Lulu Lavender Fireworks spray. 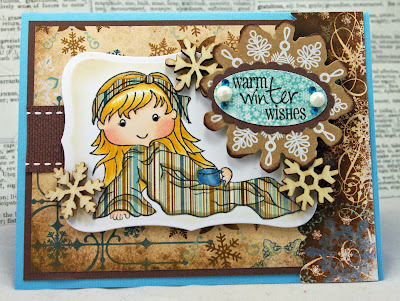 Andrea here with my Winter Challenge card. I inked up my fave Cozy Gilli and her snuggly for my inspiration as I just adore being wrapped up in something warm with a hot cuppa tea in one card. I coloured Gilli with my copies and I tried blonde hair for a change from my usual brown hair. I used Y23, YR21 and YR23. Not too bad! I will have to use this colour combo again. I hope this helps get your inspiration going for our current challenge. If you don't feel like making a card for that cold icy stuff that floats down from the sky think warm like I did! 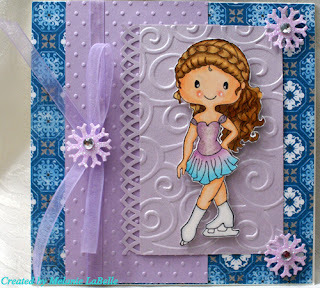 Don't forget to link up your challenge cards so that you can have a chance to win some yummy Gilli stamps of your own! it is time to show you my card for the winter challenge. Isnt Classy Gilli from Gilli Stamps pretty on her suit? 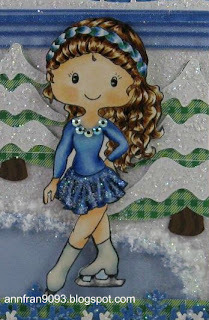 I decided to use here the paper piecing technique so I piece her outfit, hat and shoes!!! I colored her face, hands and legs and hair w/copic markers E11, E00, R20 & C9. For nestie I picked beaded oval and classic oval nestabilities. All others materials are from my stash. So now it is your turn to show us a card for winter challenge and be in a change to win a prize from Anary! Well HELLO. It’s Jo here. Wow is this challenge cool or what. What a great theme WINTER. That can be all kinds of fun stuff. From building a snowman to taking a winter vacation. Don’t you just hate that? You get all nice and cozy ready to settle into a good movie and the darn remote goes missing. So now you have to figure out is it worth it to get up, get cold and try to find the remote or just finish your hot coco and then take a nap. Hummmm…. My papers are from Prima collection called North County. I like the snowy feel the papers had. I sure hope you will join us for this challenge. It’s going to be fun to see everyone’s take on this one. Skater Gilli Enjoying Winter Fun!!! Hi Everyone!!! We loved all the beautiful entries for our last challenge! Our next challenge is to create a card or project relating to *Winter*. Super easy and fun challenge and we can't wait to see all the entries! 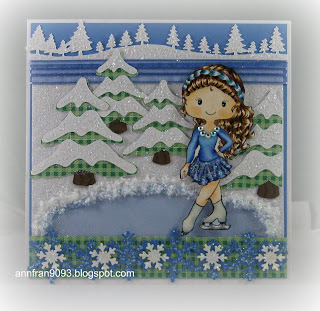 For my card I used the beautiful Gilli Skater stamp; she's enjoying some time skating on a pond. I did most of my ice skating while growing up on ponds or lakes, not at rinks, so that's where I came up with my project. Anything Goes At The House of GIILI ! my card for the Anything Goes Challenge ! Have fun with this challenge ! Happy Thursday everyone. Hope you are enjoying our Anything Goes challenge, you still have a few days to enter and the entries so far are all so wonderful. Please add you entries below using Inlinkz and stop by every so often, the DT gals always have some really fabulous and gorgeous creations to inspire you. Andi here with my entry for the anything goes challenge. I love making Valentine's day cards and here is the first one I have made for the year so far. I used Lil Gilli Girly for my card and coloured her up with my copies. 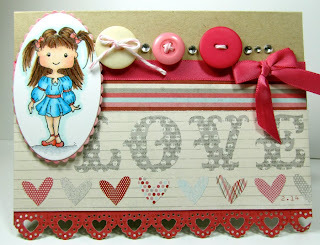 I used some of my MME valentine's day papers and hearts everywhere! I love using pink and red together and wore it frequently as a colour combo when I was younger. I still remember how upset and depressed I was when I was told you couldn't wear those two colours together as they 'clashed'. I think those rules may have gone out the window as I frequently see that colour combo all the time now! I gave Lil Gilli a blue outfit to help the image 'pop' on the card- I hope you like it! Don't forget there is still lots of time to play along with our ANYTHING GOES challenge so link up to win some yummy Gilli stamps! Hi Everyone!! It’s Wini, from LooneyBugDesigns, with your Anything Goes inspirational project for today. I am so excited to share my first Gilli project of 2012 with all of you! I used Girly 2 Gilli for this fun project. 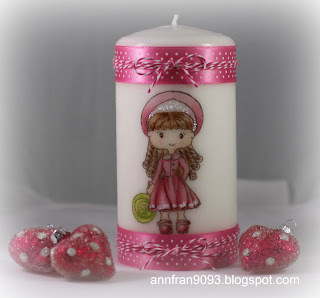 You can visit my Blog for all the details. I am always willing to try new projects so today I thought I would try coloring with my Copics on fabric! I know, I know – I am not the first to do this. In fact I used this great video by Suzanne J. Dean as my inspiration for todays project. I can’t wait to see what you make for our Anything Goes Challenge!! Be sure to scroll down to the bottom of this page to enter your project into our Inlinkz below! It is Vivi here and today is my turn to post my card for the anything goes challenge. 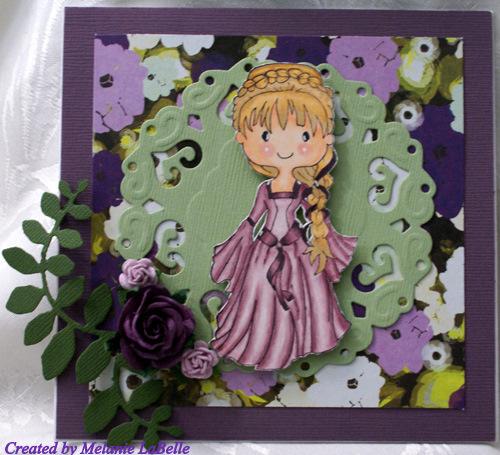 I hope you liked my card and come on over to join us!! Lollipop Gilli to Welcome in the New Year! Hi, I see we have lots of wonderful entries for our challenge! I had lots of fun trying something new for Anything Goes. I decorated a candle with the adorable Lollipop Gilli using Colleen's Tutorial. If you haven't tried this already you must give it a whirl, lots of fun. Coloring on tissue paper takes some practice, but the paper isn't nearly as delicate as I thought it would be. I did add some glamour dust, but I dabbed the glue onto the tissue paper very gently while holding the tissue paper up off the table. It was a bit tricky but I didn't want the tissue paper to stick to the paper I was coloring on. Happy 2012 Join Us ! Happy 2012 from the Gilli Family. Can you believe that it is 2012 already? It’s Jo. I am back. anaRy asked me to join the Gilli DT. I of course was thrilled to say yes. anaRy has a lot in store for 2012 with Gilli and The House of Gilli. Be sure and check back often to see what is happening. Today Asian Gilli is all decked out in pink. She has been attending parties meeting and talking with her fans and supporters. Gilli has a lot in store for you in the New Year. The challenge this time is an easy one. Anything Goes! Can’t get much easier than that can it? My card today is done in soft pinks. Gilli is colored with Copics. Her dress has a little bit of stickles added to it as well as her handbag and headdress. She is wearing a stunning pair of pearl dangle earrings to add even more elegance to her outfit. The paper is by K and Company called Lovely. It really is a Valentine paper pad but this soft pink paper had some pretty butterflies in it. Not really easy to see in the picture but is what has inspired me to break out my CC designs butterfly die cut. I also used my Slice to cut Join Us. As the card says “Join Us”. We here at The House of Gilli sure hope you will for our Anything Goes challenge. Be sure to keep stopping back to check out what my fellow DT gals have in store as inspiration. They come up with some of the cutest cards to motivate you. I am honored to work with them here at The House of Gilli. We hope to see your wonderful creations. PLEASE SCROLL PAST THIS POST COMMENTS FOR THE MR LINKY TO ENTER THE CHALLENGE.